Wondering when to get an attorney for a car accident? Wondering how much money you are entitled to? This article will walk you through what you need to know after an accident to get you the most money for your injuries. 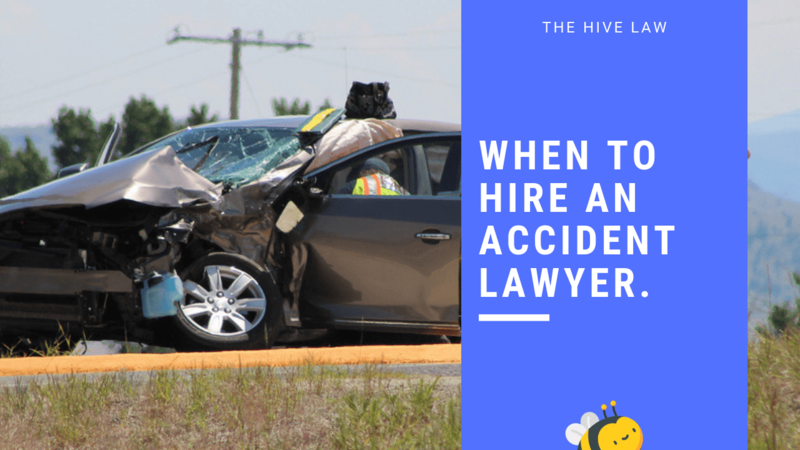 When Should You Hire An Attorney For A Car Accident? So, you were involved in a car accident. You’re wondering when you’re supposed to hire a personal injury attorney after a car accident. Do you even need a personal injury lawyer on your side for your accident? A personal injury lawyer who specializes in auto accidents can eliminate or reduce the amount of paperwork, red tape, and hassle associated with insurance claims for a car accident. If you were in a fender bender, these car accident claims can generally be handled through direct contact with the insurance company without hassle. Anything more, and you should consider getting a consultation from an auto injury lawyer. If you are going up against a car insurance company for any reason, you should not go alone. Car insurance companies have teams of lawyers that handle their cases. Hiring a car accident lawyer early will help you avoid costly mistakes that cause you to lose money. If you don’t hire a car accident lawyer early, you may be stuck coming out of pocket for expenses like medical bills and lost wages. It’s best to hire a car accident lawyer within two weeks of the vehicle accident. You do not want to settle with the car insurance company without a car accident lawyer on your side. You could be missing out on tens or hundreds of thousands of dollars without the right lawyer on your side. An experienced auto accident attorney can get you compensated for losses such as lost wages, car repairs, and medical expenses. So, what will hiring a lawyer to represent you in your car accident case cost you? Not all car accident attorneys are created equal. The same is true on how they will charge you to represent you for your car accident personal injury case. A good injury attorney accepts your case on a contingency of a “no win no fees,” meaning that they won’t charge you a dime unless they win the case for you. If they don’t win the case, you walk away without any costs on your part. However, most personal injury law firms will charge 33% of the settlement. Not every person who has been involved in an accident needs a personal injury lawyer. Believe it or not, car insurance companies aren’t out to prey on their customers. They usually are just doing their job as expected. Just fill out an auto insurance claim. Here are some auto accident scenarios where you do not need to hire a personal injury attorney for your car accident. An accident without any bodily injuries is typically one that does not need an accident lawyer to represent. If you did not receive any injuries causing you to miss more than a couple of days of work, it may not be worth hiring a lawyer. However, don’t make the “no injury” judgment yourself. If you think you may have injuries, seek a medical examination. You will want to have your doctor clear you of any medical risks. If you get cleared by your doctor, you should just file your insurance and not seek representation. If your doctor says there are medical complications, get the doctor to write a letter listing the injuries caused by the accident. If it’s questionable whether or not you need representation, fill out our form below. We can tell you whether or not it would be worth your time to hire an attorney. This is free of charge. We will not charge you to discuss your situation. You may think that since you didn’t cause the wreck that you don’t need an auto accident lawyer to represent you. This can be the furthest thing from the truth. The driver who caused the accident may not be so truthful. They are motivated to deny that they caused the accident. They don’t want their insurance premiums to be increased significantly. That person’s car insurance company also has financial motivation to make it difficult for you to succeed in your personal injury claims. In fact, this insurance company may try to make it look like your fault. Hiring a good auto accident lawyer is vital in this case. Your injury attorney can take legal action against the insurance company for a bad faith refusal to pay a valid claim. Your injury lawyer will protect you from these tactics that insurance adjusters use. Should I Get A Lawyer For A Car Accident That WAS My Fault? You caused an accident and you’re worried about what to do next. As a personal injury defendant, here’s a list of things to immediately do. Here are some things NOT to do as a personal injury defendant. Whatever you do, don’t admit that you were at fault of the crash (even if you believe you were). Don’t say anything that could be construed as an admittance of fault. We’re not suggesting that you lie. We are suggesting that you be polite, exchange contact and insurance information, and cooperate with law enforcement. However, even if an attorney, policeman, or emergency responder asks about whose fault the accident was, do not admit to fault. If anyone pressures you, just tell them that your attorney advised you to not discuss it. Reach out to an attorney immediately to get guidance. If you have been in an accident, reach out to an attorney as soon as you can. At The Hive Law, we don’t charge you for anything unless we win your case. You’re not just another case to us at The Hive Law. The best way for you to be compensated appropriately is to get your free consultation immediately. We will let you know if you have a solid case to work with or not. Let us handle the heavy lifting while you focus on more important things like work and family.